Walking into the inviting yet modern restaurant, The Sushi House, established in its new location at Fountain Head Square in 2005, according to their manager, is a delightful treat. Posh furnishings and cultural artwork make for a welcoming and comfortable dining setting. Front and center, a sushi bar and talented chef working masterfully on The Sushi Bar&apos;s creations. 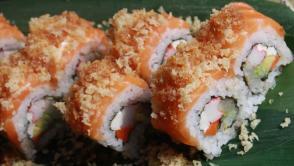 In fact, the Sushi chefs train for often weeks to roll up and prepare the best sushi possible. An extensive menu perfect for lunch or dinner and specials running weekly, check out their menu and plan to dine at The Sushi House in the near future!